Castle Acre is a large parish in West Norfolk, and was a prosperous market town for much of its history. Acre comes from the Old English meaning ‘newly cultivated land’, with the prefix Castle referring to the large and impressive remains of the Norman castle that dominates the landscape of the parish. 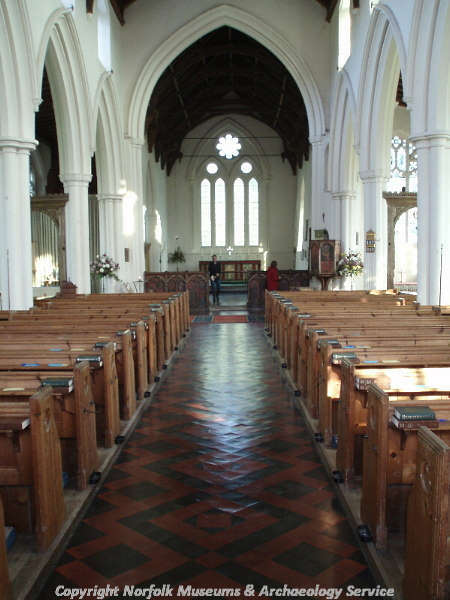 There is evidence that the parish was settled from the prehistoric period. A Mesolithic flint working site (NHER 3890) has been identified close to the River Nar, and a Mesolithic hearth (NHER 25930), also close to the river, was revealed during excavations for a new sewer in 1985. A Mesolithic axehead (NHER 22083) has also been found. Neolithic axeheads (NHER 4022, 4023), scrapers (NHER 4020, 4024) and flakes (NHER 4021), as well as a number of Bronze Age palstaves (NHER 4030) and axeheads (NHER 4096, 4032, 4031) have been found since the 19th century. The sites of two ring ditches (NHER 18819, 33815), probably the remains of Bronze Age burial barrows, are visible as cropmarks on aerial photographs. Several prehistoric pits have been discovered, containing prehistoric pottery (NHER 25923, 25927), but no specific settlement site can be identified with any certainty. The Peddar’s Way (NHER 1289) runs through the parish, crossing the River Nar. The earthworks of the Castle has mistakenly been called a Roman fort in the past, but no definite Roman settlement has been identified in the parish, although the discovery of a tessellated floor suggests that there was a settlement around this important river and road crossing, and Roman coins (NHER 4035, 16574, 29186) and pottery (NHER 4036, 4037) have been found. A large Early Saxon cremation cemetery (NHER 3781) was discovered in the 19th century, and excavations recovered burial urns, human cremations and metalwork, including Early Saxon brooches. Other Early Saxon cremations and brooches (NHER 19640) have been found close to the site of the cemetery, suggesting that it extends over a much larger area than that revealed in the 19th century. Middle Saxon pottery (NHER 19640, 25940) has also been found, as well as on the sites of the Castle (NHER 3449) and the Priory (NHER 4096). During the Late Saxon period, Castle Acre had developed into a substantial and wealthy settlement. The Domesday Book records that the majority of land was held by a Saxon thegn called Toki before 1066. Toki must have been the builder of the Late Saxon hall (NHER 3449), or burh, surrounded by modest defences, which was passed to William of Warenne after the Conquest. Warenne rebuilt the Late Saxon hall in stone, creating a grand country house from which he could control his surrounding estates in style. Castle Acre apparently became the favourite home of Gundrada, William’s wife, who died in childbirth in the castle in 1085. During the 12th century, when the civil war between Stephen and Matilda caused the political situation to deteriorate rapidly, the country house created by William of Warenne was converted into a large keep, and the defences of the castle strengthened, creating the massive earthworks visible today. The outlines of a great hall and chapel are visible as slight earthworks in the bailey, which provided better living conditions than those offered by the great keep. The outer bailey was replanned in the 12th century, when it was turned into a fortified town, with a market place at Pale’s Green. The castle was probably derelict by the end of the 14th century. The castle was not the only feature of the medieval landscape that has dominated the history of the parish. 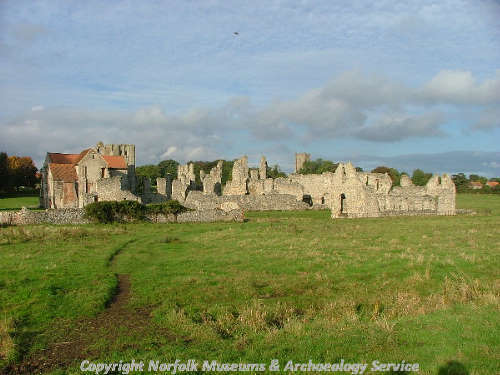 The remains of the Cluniac Priory in Castle Acre (NHER 4096) are among the most impressive in the country. The Priory was founded in 1089 by William of Warenne, and building began on the site before 1090. The Romanesque façade of the 12th century monastic church survives almost to full height, and the ruins include the remains of the 12th cloisters and the 14th century Prior’s chapel and lodgings, which were altered in the 15th and 16th centuries. The Priory was dissolved in 1537. Many of the houses in the village contain reused medieval stonework (NHER 19653, 30914, 30912, 30908, 30909, 30910), probably taken from the ruins of the Priory. Other buildings in the village have medieval origins, such as Abbey Cottage (NHER 5270), which dates back to the 15th century and may have been the almoner’s chapel. Nos. 63 and 64 in Bailey Street (NHER 21072) were once one building, and may have been a pilgrims hospice, or a fish house associated with the nearby fishpond. St James’ Church (NHER 4068) is a large parish church, dating mainly to the 14th and 15th centuries, on the site of a much earlier building, the only remnant of which is a blocked Norman opening over the later medieval priests door. 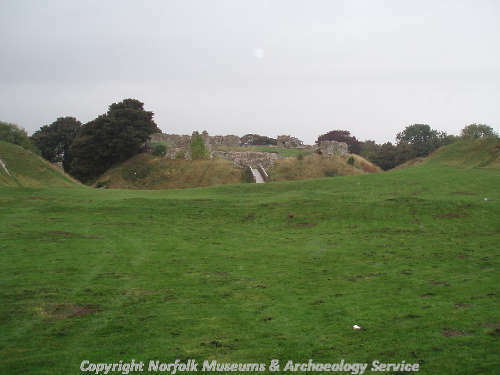 Castle Acre thrived as a market town during the medieval period, and may have had two market places, one at Pale’s Green, within the outer bailey, and the other at St James’ Green (NHER 32918). However, the nearby town of Swaffham overtook Castle Acre as a major trade centre and Castle Acre went into decline as a market town. Today, there are no obvious signs of wicked debauchery in Castle Acre, which is now a quiet, rural village.